Today's guest post comes from Lillian, who can be found writing about her kitchen adventures over at My Recipe Journey. Lillian is sharing a Valentine's Day recipe, which is great because I am seriously challenged when it comes to romantic things. Really - Valentine's Day dinner last year was fried chicken served with a side of Jack Daniels and Coke. I love to make desserts that look fancy but are easy and delicious! That's how I came up with this next recipe called 'Cannoli Cream Dessert'. I made it for my husband on Valentine's Day....he was very impressed! In a medium size bowl mix together first 4 ingredients til smooth. In a seperate bowl mix together graham cracker crumbs and melted butter. Take 2 wine glasses or other fluted stemware and place 1/4 of the crumb mixture in the bottom of each glass making a well in the center. Then add 1/4 the cannoli cream mixture on top. Repeat this one more time. Then garnish with chopped fruit and shredded chocolate. 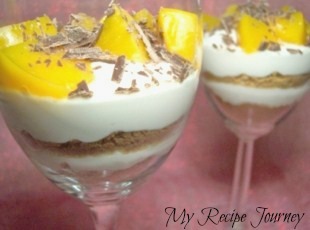 So make a nice candle light dinner for your sweetheart and serve him this for dessert! Enjoy!